The link above takes you to pages on building model rocket size motors using the sweetener sorbitol as fuel. The focus is construction and testing. You will also find information on using simulation software to predict motor performance. I do not give the propellant formulations but do provide links to sites that provide that information. Check out the page on building two stage motors. 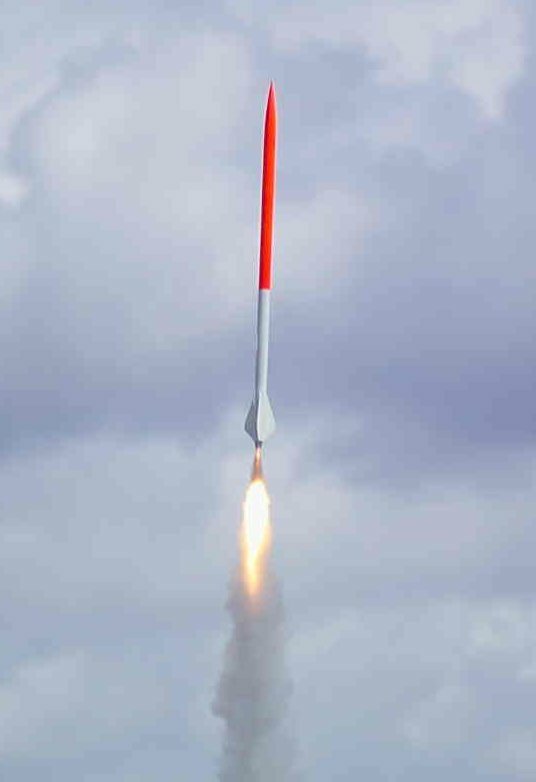 The best way to learn the full spectrum of high power (HPR) rocketry is to build and fly low power rockets such as Estes. Then when ready certify with commercially prepared HPR motors. Locate and join a local club to access launch sites and mentorship of other rocketeers. You will want to join a National Certifying agency such as the National Association of Rocketry (NAR). If you want to build your own HPR motors you will want to join Tripoli as NAR only supports commercially prepared motors. The image above is my Binder Jaguar flying on a level 1 HPR "I" motor. The following page is my attempt at level two HPR certification.